Full Attendance of Fruits in Shower Products. Which Shower Product are you Hooked To? “Yes” (Missing in the picture though!) ----- and all other fruits are there! Enliven and Original Source are recently added and I kept the cello tape with it so that they do not leak when I lie them down. I super love with Spiced vanilla. Its been my love from the first time I smelt it in 2010 winter. Keeping this for winter. Loving the green tea on sunny days and Palmolive coconut on rainy ones. 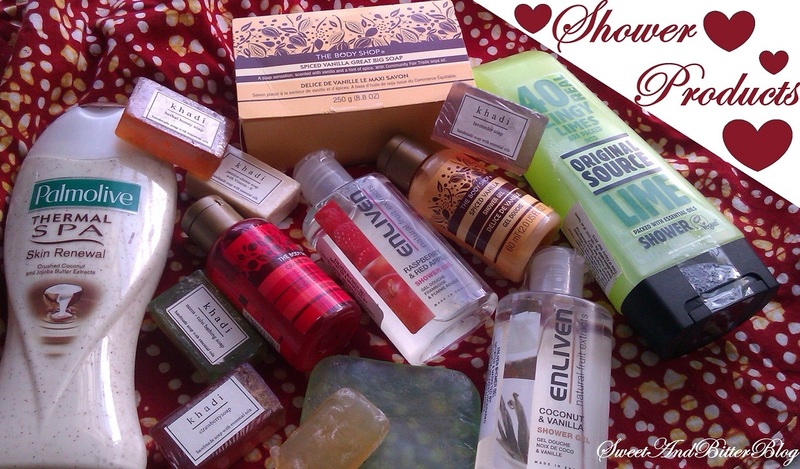 Which shower Gel/cream/soap are you currently hooked to? Raspberry Ripple from The Body Shop but recently bought Strawberry shower gel which I haven't gotten the chance to use it yet but loving the Raspberry Ripple ^_^. I loved the LIME shower gel from the Original Source. Sadly, it finished few weeks back. Kind of regret not buying the Spiced Vanilla from TBS :P.
How is Seri one dear? You talking about the one which is transperent with beads in it right? I heard that its very difficult to take out when its about to end...do review it! How have you been? I wish we had some more time to catch up at random events. I personally love khadi soaps, they are earthy and pure. And yes Khadi soaps are really nice. In fact the manufacturer for both of Khadi and Fab India soaps are same! I'm currently loving Palmolive thermal Spa Skin Renewal, its really nice though I feel it'd be great for cooler weather. I have used Enlivens cocoa butter lotion..was amazing..dint find another one in Bhopal..and since online sites offer you a great variety never really tried out the same product.. I have some bath n body works shower gels that are fruity scented, love fruity scents too.